A Trip Down Meme-ory Lane: What is 322? 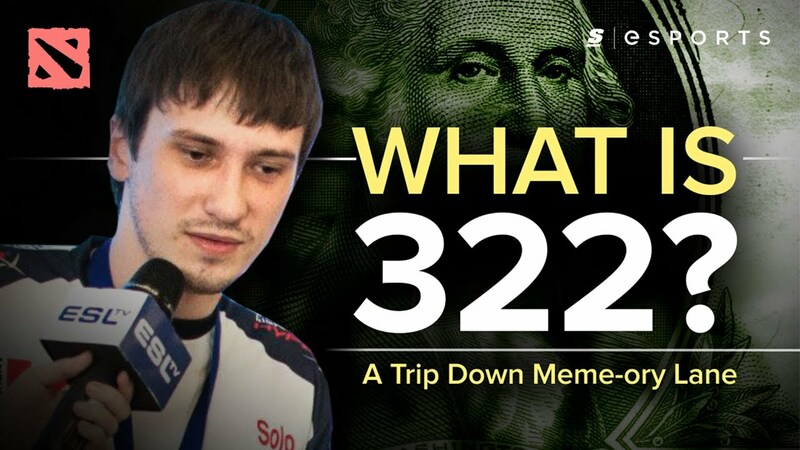 It could have been just a case of a team clowning during a meaningless game, a concept that’s not exactly uncommon for Dota 2, but evidence surfaced that RoX.KIS player Alexei “Solo” Berezin had bet against his team. With the odds so firmly in his team’s favor, the bet would turn $100 and a loss into... $322. StarLadder banned Solo from their events for life, issued three-year bans to his teammates and banned the RoX organization for a year. RoX initially defended the team, saying that the evidence was inconclusive, but the player eventually admitted that he had placed the bet, and RoX apologized as Solo left the roster. Well, in-game — or in Twitch chat — it is now basically shorthand for any play that is bad enough to be suspicious. When used outside of the game, a 322 simply refers to match-fixing. In our current era of esports, the idea of throwing a game for 322 dollars seems ridiculous. But Valve took the matter seriously and, according to a Facebook post by former manager Tiffani “Oling” Lim, they held a briefing at The International 4 which clearly stated that match-fixers would be banned from Valve events forever. This set the tone for the future of Dota 2 esports and underscored the fact that all future match-fixers would not receive the leniency that Solo had. As for Solo’s career, he managed to bounce back despite the incident. Now a member of Virtus.pro, who recently won DOTA Summit 7 and came second at the Kiev Major, the ban is comfortably in the rear view mirror.